The i4wheels computer wheel aligner represents a new era in design and functionality. The logo and name was chosen to interact with the design. Together with the functionality of i4wheels, one can definitely say that it has an eye for all 4 wheels. 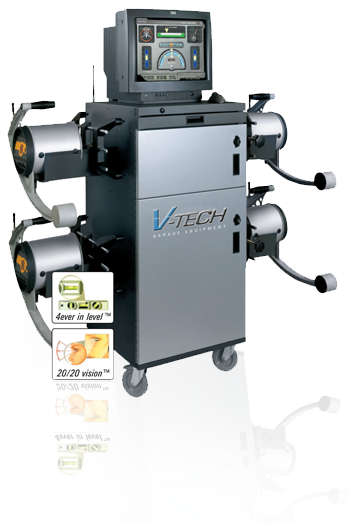 For the V-Tech development team two aspects was considered during development – simple design and easy to use. The i4wheels prove to be the best quality/price computer wheel aligner on the global market. All angles are measured by means of the 8-sensor CCD camera system with a measuring range of +/- 25 degrees – we call it 20/20 vision. No electronic turntables are needed since the caster swing is measured at either 10, 14 or 20 degrees for high accuracy by use of the CCD cameras. The 4ever level model has an integrated electrical engine to keep the measuring head in level at all times – that eliminates time consumed for running around the car numerous times during measurement and adjustment. Standard is the V-Tech Win software – easy and fast to use. Excellent graphics makes the software comprehensive and calm for the eye. For service purposes the i4wheels measuring head is calibrated individually. This offers a huge advantage in servicing for both the customer and provider. 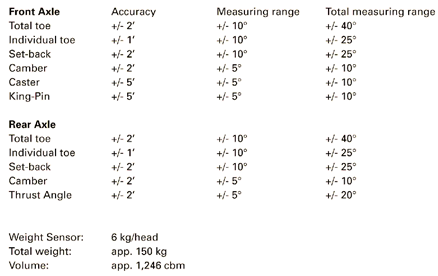 Downtime can be avoided by sending a new measuring head to exchange for the measuring out of function. The integrated electronic engine makes rolling run-out compensation just as easy as with 3D wheel aligners.